I feel as though I've been working on this for ever, so I'm so excited to be able to finally wear it! 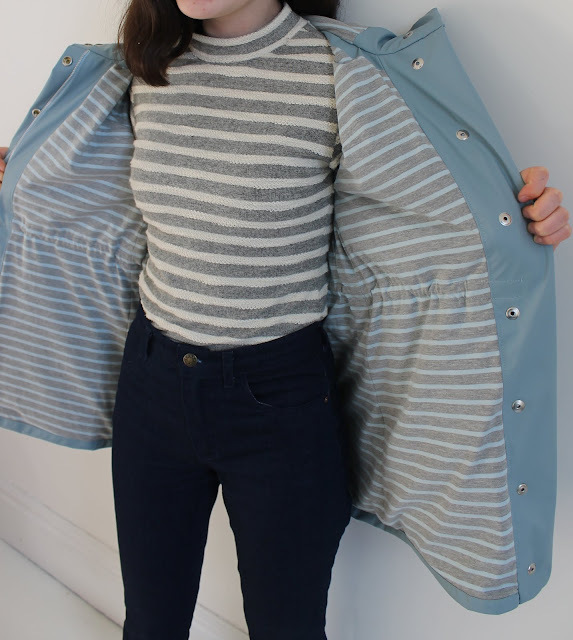 It is, of course, my Kelly Anorak. Last year, I decided that I wanted to try and make something that would really push my sewing skills, and so I chose to make the Closet Case Patterns Kelly Anorak. 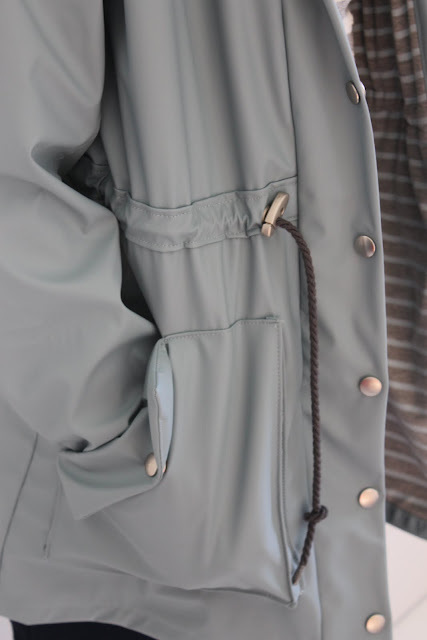 The plan to make an anorak has actually been with me for a while, although it didn't fully form until quite recently. Before I even got onto the sewing, there were so many different things to do to prepare, and so I did everything bit by bit. First, I bought the fabric when I visited Stoff and Stil. It is an absolutely stunning duck egg blue fabric. I also decided to make the lined version of the anorak, so I purchased this gorgeous jersey from Higgs and Higgs which is incredibly soft. Following this, I slowly assembled all the pieces: the rivets, the zip, the snaps etc. 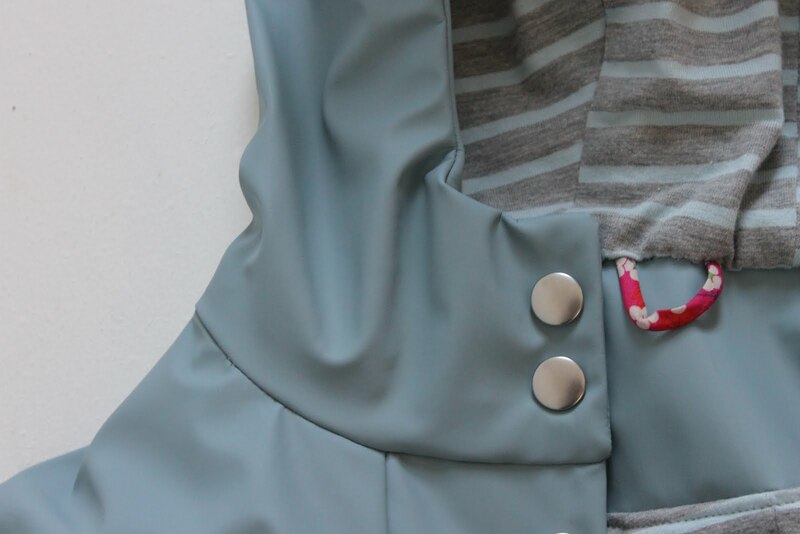 Making this anorak was... a test of my patience to say the least! There were a lot of pattern pieces, especially as I made the lined version. This is definitely the longest I have ever spent on a project but it was absolutely worth it. The fabric is one of my favourite parts, I absolutely love the colour, and I also really like the lining. I made the sleeves out of one of those slippery fabrics, which is something that a lot of ready to wear coats use as their lining. It really helps to get the coat on and off, and it meant that I was able to get all of the necessary pattern pieces out of the fabric that I had. There were definitely some parts of making this that were exasperating, so I would recommend having a big project like this as something going on in the background - at the same time I made a couple of breather sewing projects which helped to make the whole thing less intense. The lining comes as an expansion to the original pattern, but not all of the original pattern pieces are required when using the lining pieces. For example, there is a new sleeve pattern piece which you need to cut both the main fabric and the lining fabric out of. I did find this slightly confusing at first as it wasn't perfectly explained on the pattern, but after some persevering I did manage to make sense of it. 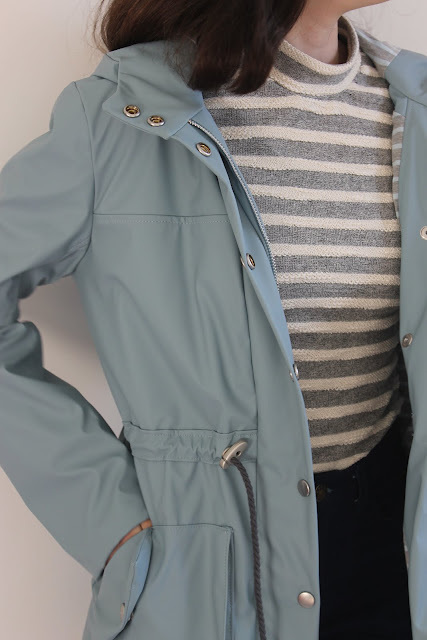 I would also recommend using the sew-along for this anorak. I pretty much relied solely on this and hardly glanced at the instruction booklet. There are so many parts of this anorak that I love, it's impossible to choose my favourite aspect! I am so pleased that I decided to line it though, I think that it looks really nicely finished. The lining also adds a bit of extra warmth which is necessary during spring here! One of my favourite parts is the Liberty hanging loop. I love splashes of colour so much, and this is one of my favourite Liberty prints, so it feels just right to have it inside. I also love the hardware, I think it gives it such a professional finish! While hammering in snaps and rivets is slightly terrifying, it is definitely worth it: I love the end look. I had a bit of difficulty finding the right cord, and while a lighter grey would have been my first choice I'm actually really pleased with the dark grey. 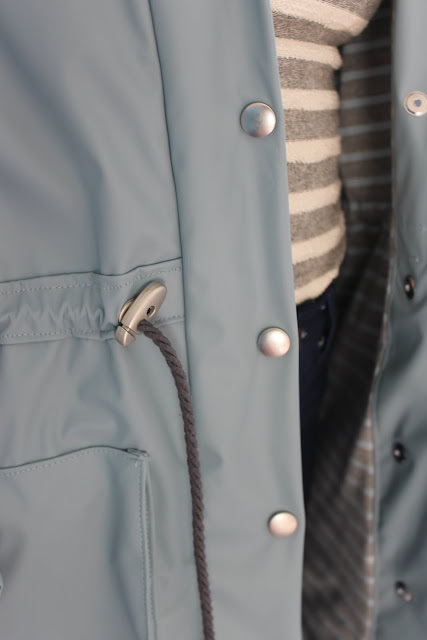 The cord locks are also from Stoff and Stil. I haven't bought any cord stoppers yet, but a bit of sellotape on the ends of the cord is definitely not going to put me off wearing this coat! I really can't say how pleased I am with this. I just love it! I think it might be one of my favourite things I've ever sewn, and it's definitely one of my proudest makes. It's also finished in perfect time for spring, so I hope that I'm going to be getting lots of wear out of it soon. Wow this is amazing! Your standard of work is that of someone who has been making anoraks for years and years. Well done. I made a lined duffle coat and had similar experiences, so many pattern pieces, so many new techniques! It is absolutely worth it though. Thank you so much! I expect I will be making more in years to come, a lined duffle coat sounds like just my cup of tea! Wow, wow, wow!! This looks amazing! You did an absolutely fantastic job putting this together. I love this color and now want this color for myself! I have been wanting a different color jacket and couldn't decide which color to make. :) The sky is the limit. You can make anything and you should not hesitate to try. There are so many different steps in making this jacket and you made it to perfection. Well done!! Thank you so so much! The colour is one of my favourite parts too. I really feel as though this is one of those projects that makes one feel that they can sew anything! The striped jersey lining is brilliant. The anorak looks flawless - very RTW. Great job! Thank you! The pattern matching was well worth the effort. Your jacket is PERFECT!, and I don't mind telling you that I am a bit envious because I have had this pattern over one year and have shyed away from it because it is so detailed. You did a fabulous job! Thank you! Don’t hesitate to sew the Kelly. - it’s hard work but is definitely worth it in my opinion. Well I think you Kelly Anorak is just FABULOUS!!! You did exceptionally well on this, and you should be proud of yourself. And you have caught the bug, lol! 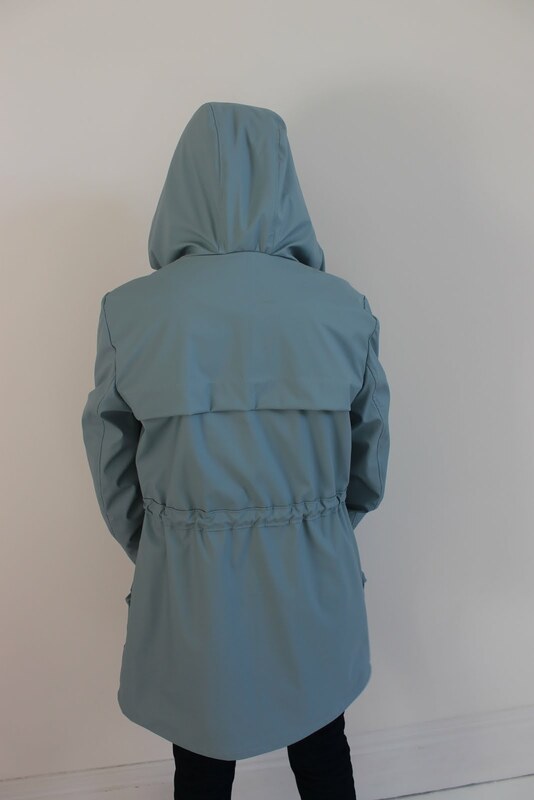 The Anorak bug! Would you ever make another one? I love mine so much, and think I may make another one for next spring. Either way, enjoy your lovely jacket!!! Thank you very much! 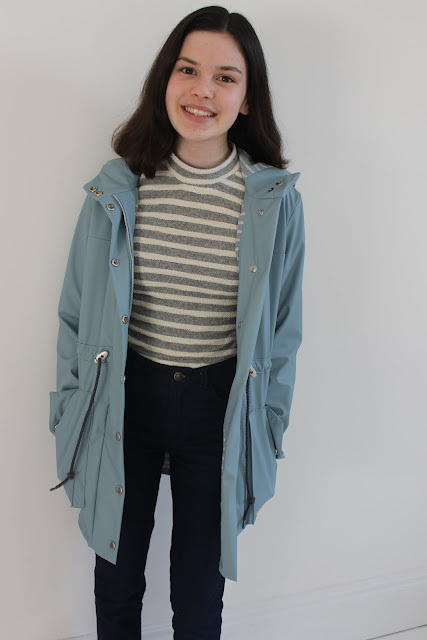 Yes, I have definitely caught the anorak bug! Omg your anorak looks absolutely beautiful. It was well worth all the hard work you put into it. I've read many reviews on this pattern and everyone talks about how overwhelming the amount of the pattern pieces is. I love the fabric you used for the lining; it was such a perfect fit. You really ought to be proud of this make. What a wonderful job you did! Thank you so much! It took a long time but is absolutely worth it. Thank you! I agree, I love the finish of all the hardware. This is truly a work of art. I love the little hanger in your favourite print too. You should feel mighty proud of yourself this is very accomplished! Thank you! The little bit of Liberty makes me smile every time. Oh, thank you so much! I do love the colour. And thank you for sharing it on your blog. This looks fabulous and you should be very proud of yourself. Oh my word this is incredible! What a gorgeous coat. I am so impressed. I wish I had even a tiny amount of your talent! Wow that is really lovely. Just popped over from Three Stories High on Jo’s recommendation well worth the hop. Hi Kelly, I came here from another blog who mentioned your beautiful make. I'm so impressed! You are very talented and your jacket is fantastic. You should be so proud of yourself! Thank you, it was well worth all the time and effort put into it. Thank you so much! 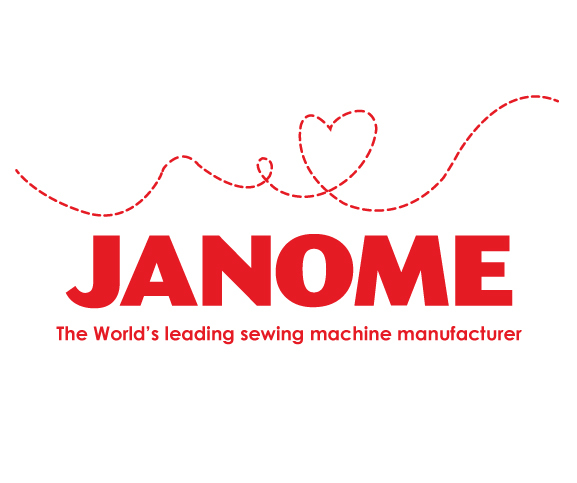 I hope I can help inspire you to give dressmaking a go. Thank you! I love this pattern so much.